Here’s what I love – INSPIRING AND HELPING PEOPLE!! How do I do that? There are live events, but if you have a busy schedule, like most of us, or don’t want to travel, FEAR NOT! You can benefit from my years of wisdom without leaving your home! there is – http://www.secret2anamazinglife.com – where you will find over 700 articles to learn from and be inspired! Help me help you. Subscribe to one or both of the FREE sources listed above and begin to change your life for the better! This may seem like a no-brainer. That being said, ask yourself “How many things do I do everyday for the simple reason of making myself happy?”. There seems to be an endless list of things we need to do every day like walk the dog, go to work and clean the house. Still how many times do we take a second to do things that truly bring a little joy to our lives? A lot of people may find this to be selfish, but to all of my altruistic friends out there, remember you can serve others far better when you are coming from a good place. Let us explore this idea of creating a list of things that make us happy. It can be things we do already, or things that we used to do. It can be things we have wanted to try, or things we forgot about. It can be simple things that only take a minute or complex things that may take a few days to enjoy. Let us take a look at a few examples to get us started. A while back I wrote a post about mixing different flavors of soda at fast food restaurants. As a child it was something I was always told I should not do. To this day I can’t really understand the problem with it. Guess what? About 75% of the time I get a soda at a place I have the option to, I mix the flavors. I still chuckle a bit to myself each and every time I do it as well. So even if something seems rather silly, put it on your list! Another thing I have noticed is how special things we do that bring us joy can slip in the familiar. Let me explain. A few years ago I had moved into the place I am now living. In the move I took a while to set up my fancy coffee maker. Coffee being one of my guilty pleasures. As an author I think it should be allowed as a tax deduction, but I digress. When I finally set it up I recall the lady in my life bringing me a fresh hot brewed cup of coffee first thing in the morning. If memory serves I think the clouds parted and angels started singing, but don’t quote me on that. Funny thing is, fast forward 2 years later and it is something I do as I am getting dressed and ready for work. I grab my cup and run out the door barely even realizing I made it until I take that first sip. With a moment of focus I can once again appreciate this morning ritual. Even the act of writing it down can serve to remind me how much joy I receive through a simple cup of coffee. 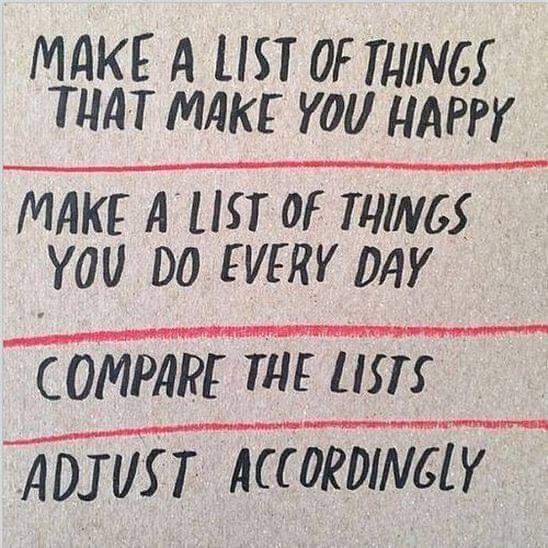 So take some time this Monday and create your own list of things that make you happy. Smiling at strangers? Saying good morning to your favorite coworker? Eating a fresh salad for lunch? Maybe a simple cup of coffee or mixing soda at a fast food restaurant? Write them all down and carry your list with you throughout this week. See if you can sneak in several of the items everyday. Please feel free to share any of the items on your list and how you put them into your day in the comments below. Share this idea with a friend and both try it. That will only make it far more fun. As always, feel free to share this blog post as well.